Dave Adams originally formed the band Osiris back in 1986 and they continued through the late 80's with live gigs and cassette releases. After playing with various cover bands, Adams and Milo Black formed the Hawkwind tribute band Assassins of Silence in the early 2000's. But by the end of the decade Adams was keen to get back to performing original material, and asked Black if he wanted to join a revived version of Adams' old band Osiris. 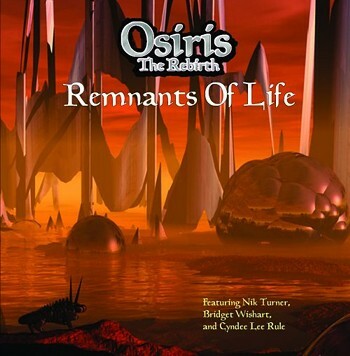 Now unfortunately having competition with a number of other bands named Osiris, they decided to call the band Osiris: The Rebirth, and so Osiris was reborn. Remnants of Life finds the duo in fine form, playing most of the instruments themselves, but also joining them are a few high profile guests including Cyndee Lee Rule, Nik Turner, and Bridget Wishart, amongst others. From the humorous opening of a space/time craft launch (where a unit of measurement called kilobrocks is referenced), the band launches into a top notch album that delves into numerous different styles, tied together by groovy sci-fi and fantasy themes. From the instrumental space jam Colgate Valentine, to the dreamy electropop of Starlight Scorpio (co-written and sung by former Hawkwind member Bridget Wishart), to the unabashed Hawkwind style space rock of Siren, to the soft ambience of Gymnofeetie, to the gorgeous and quite riveting progressive rock fantasy of Dragonslayer, the band covers plenty of ground, and that's only in the first half of the album! Conjuring up images from those trippy covers of sci-fi and fantasy paperbacks of the 60's and 70's the band weaves their mystic tales as one song melts easily into the next, from the spaced out reading of the Egyptian Book of the Dead in Osiris (which features Nik Turner on flute), to the searing, tripped out Ozric Tentacles influenced cosmic jam of Karmic Vortex to the surprising power ballad with a clever sci-fi twist love story of Technology, the band is not afraid to stretch their creative limbs and try a number of genres. Yet they retain their own sound throughout all of it. Short connecting pieces tie the album together into a consistent whole that shimmers and glows with the creative energy of its players. The disc ends with the 15-minute long epic End of Something, a progressive rock monster that soars to the stars with dreamy melodies sung by guest Kim Novak, flute by Sky Sownd and smoking electric viper violin from Cyndee Lee Rule, not to mention some terrific playing by the core members, including some ripping guitar and dazzling synth playing from Milo Black. But wait! There's a hidden bonus track too! Well, I'll leave that one as a surprise for when you get the CD (it's not available as a download, just on the CD). With references on the album to The Watcher, Kilobrocks, Sonic Attacks and Golden Voids, it's clear that Adams and Black have a great love and reverence for Hawkwind (don't we all? ), but this is no Hawkwind clone band here. Entwining numerous styles into a seamless blend all their own, Remnants of Life is a stunning album from a long lost band reborn. Let's hope we hear lots more from them! Highly recommended!